Carbon Action (part of the Chris Mee Group) is a leading provider of Data Centre GHG Permits and EU-ETS Compliance. Our services include Data Centre GHG Permits and EU-ETS Compliance, energy management consultancy and many more. We are partnering with numerous data centre operators in the EU who were previously unknowingly in breach of EU and Environmental Protection Agency (EPA) legal requirements on GHG emissions. We solve current and legacy compliance issues for our clients. 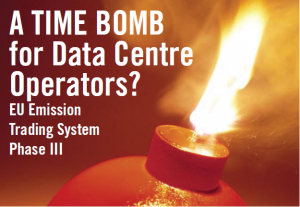 How do Data Centre Operator's breach EU Legal Requirements and not even know it? Data centre operators usually install sufficient standby electrical generating capacity to allow for uninterrupted service provision to customers. However, the operators can make erroneous calculations leading to unintentional legalative breaches. Many facility managers know that 10 MWe of stand-by electrical capacity equates to approximately 27 MW thermal input. The law states that if thermal input of the installed capacity of stand-by or emergency generators exceeds 20 MW then you are required to apply for and obtain a GHG Permit from the Environmental Protection Agency (EPA). Organizations operating emergency generators with a rated thermal input of 20 MW or greater are required to submit GHG permit applications for all qualifying Installations without delay for the activity "Combustion of fuels in installations with a total rated thermal input exceeding 20 MW (except in installations for the incineration of hazardous or municipal waste)". The above extract relates to GHG Permit compliance from January 2013 onwards – however the earlier legislation is still enforceable, for periods as far back as January 2005, when the EU Emission Trading Scheme (ETS) was initially transposed into local legislation. How can the Chris Mee Group - Carbon Action help Data Centre owners and Operators? Carbon Action can advise and assist you in making an appropriate GHG Permit application, should your facilities be above the 20 MWt threshold. We have worked with a large number of data centres in obtaining GHG Permits in the last three years. We have successfully brought those data centres into compliance and avoided enforcement action by the EPA. No enforcement actions have arisen in any case in which we have assisted data centres to achieve compliance. Webinar - How Green is Your Data Centre?